This week, I’m checking in with Harvard Law School associate dean Jessica Soban on the school’s year-old GRE pilot program. Soban also gave me the scoop on the first year of Harvard’s expanded deferral program, in which college juniors can snag a spot in the J.D. class, provided they graduate and go work for two years before starting their legal studies. I’m also looking at the lack of gender and racial diversity among the law professors who landed on the latest version of University of St. Thomas Law Professor Gregory Sisk’s closely watched “scholarly impact” rankings. Not signed up yet to get Ahead of the Curve sent to your inbox each week? Go here. The University of Arizona James E. Rogers College of Law was the GRE trendsetter in 2016 by being the first law school to accept the test. But I’m convinced that it was Harvard Law School’s decision to follow suit a year later that really kickstarted the movement toward the LSAT alternative. (To date, 23 schools are accepting the GRE.) 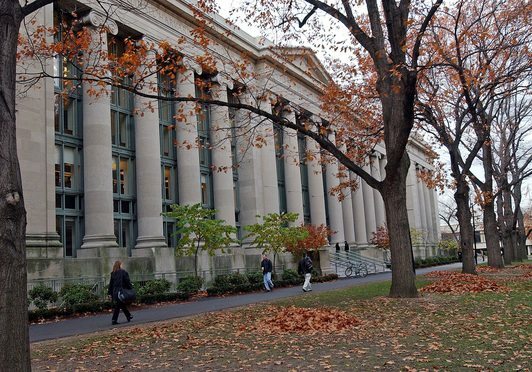 Let’s be real: When Harvard Law School makes a move, people pay attention. Several months after announcing that Harvard Law would accept the GRE, it unveiled the expansion of a pilot program that offered Harvard College juniors a spot in the law school provided they leave campus for at least two years and get some work experience. The law school last year opened up that program to college juniors around the globe. Now that the school has admitted the first cohort of students under the GRE and expanded deferral programs, I rang up associate dean for strategic initiatives and admissions Jessica Soban to see how it went. She gave an enthusiastic thumbs up to both initiatives. Here’s what Soban told me about the GRE pilot. The school plans to track the performance of those GRE admits to gauge how well the test does or doesn’t predict first-year grades. But for now, Harvard plans to continue the pilot in the current admissions cycle. So the program met pretty much all the goals the school laid out when it decided to accept the GRE, with the overarching aim of making legal education accessible to more people. But how many people actually applied with GRE scores? Harvard isn’t saying, though Soban told me it was a relatively small number. (The school is keeping mum on the numbers because it doesn’t want people drawing conclusions from a small sample, Soban said. She expects that number to increase this year now that more than two law schools accepting the GRE.) But one figure Soban was willing to disclose was that the GRE applicants had an acceptance rate comparable to the acceptance rate among those who applied with LSAT scores. That’s a significant vote of confidence in the GRE applicants considering that this year’s acceptance rate was a relatively low 12 percent. Among the interesting tidbits that surfaced during my talk with Soban was that Harvard saw a 32 percent increase in applicants for this fall’s class. That’s much higher than the national 8 percent increase recently reported by the Law School Admission Council. Lets move on to the deferral program. Again, Soban declined to tell me how many college juniors applied and how many were accepted. But 100 percent of those who got an offer of admission accepted, she said. The law school won’t actually welcome them to campus for at least three more years, as they graduate and enter the workforce on a temporary basis. As with the GRE program, Soban said the deferred admissions program skewed more heavily toward STEM applicants than the general J.D. applicant pool. The takeaway: What does it all mean for other law schools? That’s a hard question to answer given Harvard’s unique position at the top of the law school food chain. I’m not convinced that many college juniors would commit to working for two years before pursuing law school without the guarantee of the prestigious Harvard Law name on their J.D.s. But Harvard’s experience with the GRE may offer clues as to the outcome of the current admissions cycle, with more schools admitting small but strong cohorts of GRE takers. I’ll certainly be interested to hear how the Harvard GRE admittees stack up to the rest of the class, though. It’s not hard to imagine Harvard and other schools rethinking their embrace of the GRE should those students struggle. The law professor blogosphere was giddy last week with the arrival of the closely watched “scholarly impact” ranking of law faculties periodically put out by University of St. Thomas School of Law Professor Gregory Sisk, with the help of colleague Nicole Catlin and several others. For the uninitiated, Sisk ranks the top third of ABA-accredited law schools (as determined by U.S. News & World Report) according to average and median journal citations from the past five years to scholarship published by their faculties. The methodology was developed by University of Chicago law professor Brian Leiter (more on him later) and seeks to figure out which law schools have the biggest scholarly impact. The overall results are a bit of a snooze, with all of U.S. News’ top 10 also making Sisk’s top 10, with the exception of Vanderbilt sneaking in and Michigan missing the cut. UC Irvine, ranked No. 21 by U.S. News, lands at an impressive No. 12 on Sisk’s ranking. What really caught my attention were some subsequent lists that law professor bloggers posted using Sisk’s data that reveal a startling dearth of women and minorities among the most-cited law professors. Leiter posted a list on his blog of the top 10 most-cited professors from 2013 to 2017, and nary a woman made the cut. (Harvard’s Cass Sunstein; UC Berkeley’s Erwin Chemerinsky; and Chicago’s Eric Posner grabbed the top three spots.) Only one minority professor, Yale’s Akhil Amar, landed in the top 10. Tax law didn’t fare much better in the gender diversity department. Pepperdine Law dean Paul Caron offered a list on his Tax Prof Blog of the 19 tax professors who were counted among the ten-most cited faculty from each of the 68 law schools ranked by Sisk. Only five women made the list. My thoughts: The numbers pretty much speak for themselves. And I wasn’t the only one who noticed just how very white and male these lists are. 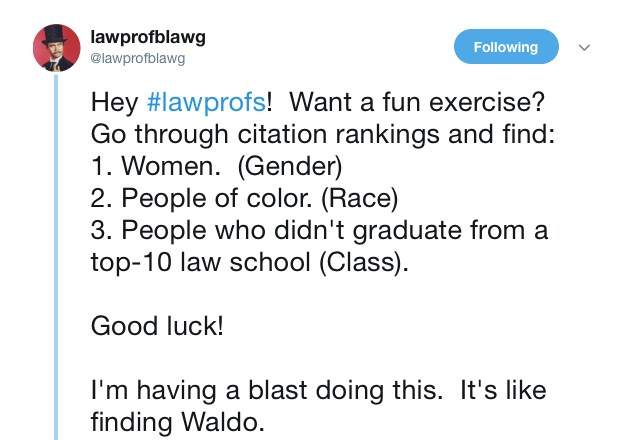 The always astute anonymous law professor who tweets under the handle @lawprofblawg went on a Twitter tear Aug. 15 about the lack of racial and gender diversity of the most-cited professors. @lawprofblawg found just five women and 8 people of color among the 50 most-cited faculty at the five schools atop Sisk’s list. “I just can’t,” the tweet said. Here's Law.com's latest Legal Speak podcast featuring yours truly discussing the latest NALP jobs numbers and new data showing law school applicants were way up this year. I also interviewed AccessLex Institute's Chris Chapman about whether or not it's a good time to go to law school. In case you missed it, Arizona Summit Law School canceled fall classes while it tried to hang on to its ABA accreditation. Some of its remaining 80 students will be able to take fall classes at the Arizona State University Sandra Day O’Connor College of Law as visitors. The Southeastern Association of Law Schools announced it will hold its own faculty hiring conference next August, challenging the Association of American Law Schools, which has been the only game in town for entry-level faculty hiring. Here’s a pair of sad stories involving law students. UC Berkeley 2L Brian Lewinstein is presumed dead after falling from an Oregon waterfall on August 12. And the Georgetown Law community continues to raise awareness of the plight of 2L Austin Tice, who was kidnapped in Syria in 2012 while he was working as a freelance journalist. This is weird. A tax lawyer in Texas sued Georgetown after it denied his application to participate in a job fair for tax LL.M. students as an employer. He claimed the school was retaliating against him because administrators believed he falsified his resume five years ago, when he was a student in its tax LL.M program. A judge tossed the suit. BYU Law is teaming up with the University of Arizona James E. Rogers College of the Law for the second iteration of its LawX class. Classes at both schools will develop solutions to evictions in Utah and Arizona. Thanks for reading Ahead of the Curve.